Companies that are ahead in migrating to the cloud—Trailblazers, as we call them—are seeing diverse benefits from cloud adoption, including collaboration among business units and partners, improved customer service, and time to market. But how are these companies measuring and managing this success in the cloud? 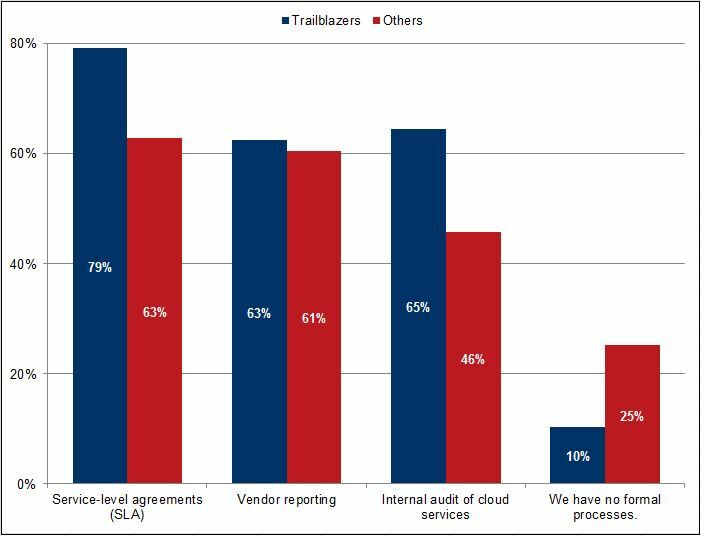 As you can see, Trailblazers are much more likely to rely on SLAs and internal audits compared to their peers. How do you manage the quality and integrity of cloud services? (Click to enlarge) Worryingly, a quarter of non-Trailblazers have no formal processes in place for managing cloud integrity. Nearly 60% of our Trailblazers reported having defined metrics in place for measuring KPIs. Coming up, we’ll take a look at what Trailblazers expect and value from their cloud service vendors. This entry was posted in Research and Reports and tagged cloud, Migration, SLAs by Ben Wright. Bookmark the permalink.